From Goodreads: When privileged 17-year-old Jasmine gets kicked out of her house, she takes what is left of her savings and flees to Santa Cruz to pursue her dream of becoming a musician. Jasmine finds the ideal room in an oceanfront house, but she needs to convince the three guys living there that she's the perfect roommate and lead guitarist for their band, C-Side. Too bad she has major stage fright and the cute bassist doesn't think a spoiled girl from over the hill can hack it. . . . 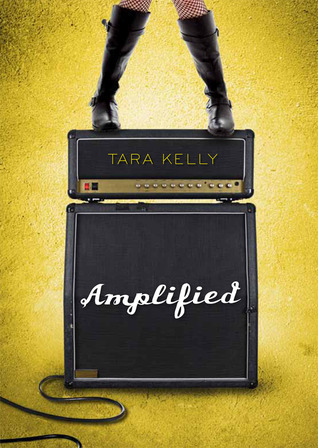 In this fresh new novel by critically acclaimed author Tara Kelly, Jasmine finds out what happens when her life gets Amplified. I'm loving the sound of this. And I love the cover - it really caught my eye! It's published October 2011 by Henry Holt & Co. I love the cover. It sounds brill, I love books that have music in them! Wow it sounds and looks awesome! The cover really caught my eye as well! This sounds like an interesting book.